From this point of view, the cultural baggage of a Mihail Sebastian  or a Eugène Ionesco  – francophile spirits, if there ever were any! – was much more representative of the young Bucharest intelligentsia of the day than was Cioran’s . . . A discrepancy saturated with momentous issues and which has perhaps not been sufficiently emphasized. 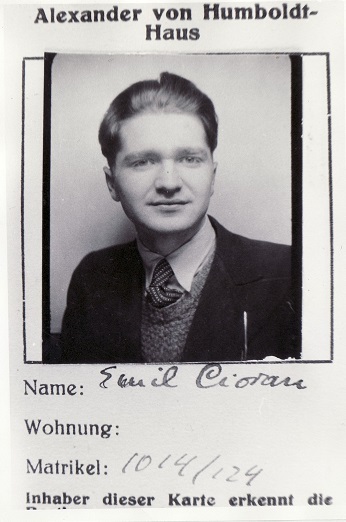 For that matter, one of the great questions raised by this part of Cioran’s biography is no doubt the following: How to explain the suddenness with which the young student, put into contact with Hitlerism, let himself be convinced to put his incisive pen and his vast culture in the service not only of liberticidal, but essentially deadly causes? The question is all the more difficult in that we cannot satisfy ourselves with the argument of temporary folly. “I know for certain that I will never go mad,” he quite precisely wrote to Bucur Țincu  in 1932. And, does one become mad simply by constantly calling for madness in one’s literary productions?